While he played just 14 minutes on Monday night, Jimmer Fredette was welcomed back to Utah with open arms. The former BYU star, who signed a deal with the Phoenix Suns to finish out the season last week, received a warm standing ovation upon entering their matchup with the Jazz at Vivint Smart Home Arena. The Jazz, though, dominated nearly the entire night and cruised to a 125-92 win, their seventh win in eight games. Fredette finished with six points — four of which came on free throws — and shot just 1-of-10 from the field. He also went a rough 0-of-5 from the 3-point line. His impact was minimal on Monday night, but it’s clear that BYU fans in Salt Lake City haven’t forgotten what Fredette did for their program nearly a decade ago. Not much was working for the Suns on Monday in their 33-point loss. 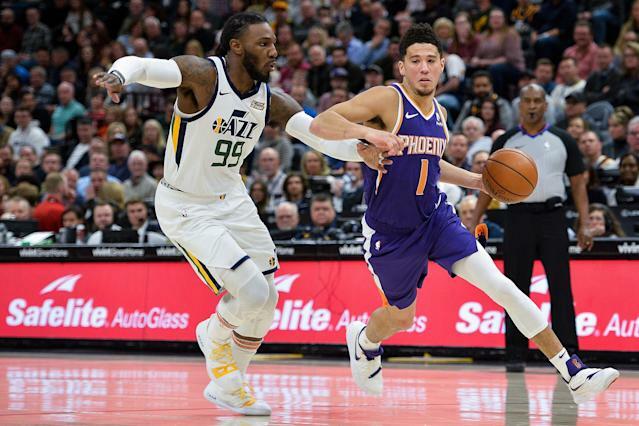 Devin Booker was the exception — and that’s putting it lightly. Booker scored a season-high 59 points, shooting 19-of-34 from the field and 5-of-8 from the 3-point line, absolutely dominating offensively. The Jazz simply had no answer, even when they put two defenders on him. The 22-year-old accounted for more than 64 percent of their points alone, and was the only Suns player to score in double figures. Center Deandre Ayton was the closest otherwise, finishing with nine points and seven rebounds. Booker is now just the fourth player in league history to record multiple 50-point games before turning 23. He’s also just the second player in Suns history to have multiple-50 point games, joining Tom Chambers. While his first attempt at the NBA wasn’t very productive — he played sparingly for four teams in five years — Fredette quickly found success on the other side of the world. After playing in his final NBA game with the New York Knicks, Fredette signed with the Chinese Basketball Association’s Shanghai Sharks in 2016. He was named the CBA’s International MVP in 2017, led the league in scoring with 36.9 points per game and dropped a league-record 219 3-pointers last season. Even though the CBA isn’t the same talent level as the NBA, Fredette’s performance in the league is still extremely impressive. The three-time CBA All-Star, though, said that his goal after this season in China was to find a way to make it back to the NBA, and that it was in the back of his mind all year. Suns coach Igor Kokoskov said that once Fredette’s responsibilities with the Sharks had ended and he became available, they added him to the list of players they were considering signing to help them finish out the season. Once things had fallen into place, the Suns made it official — signing Fredette through the end of the season and adding a team option for next year. Fredette’s start with the Suns has been slow — he played just four minutes in his debut on Saturday — but that’s to be expected. Kokoskov, understanding what the 30-year-old can bring to the table, said they don’t want to jump the gun. 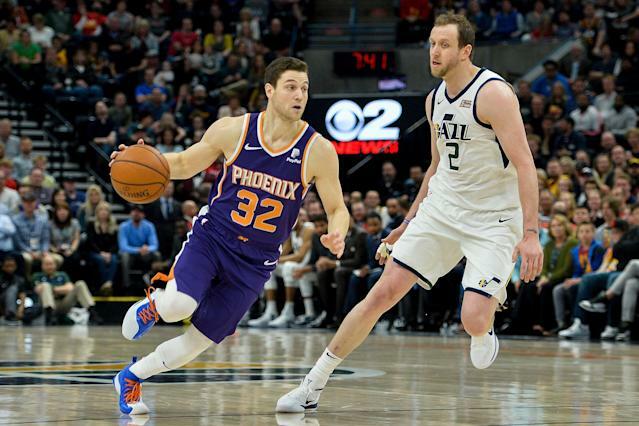 While his future with the franchise is still up in the air, Fredette said he feels he can fit in well with the Suns and their young core of players. Now, though, he just has to prove it.